My boyfriend thinks I’m a little pumpkin-crazy because usually whenever we step foot into Trader Joe’s, I usually head straight to the aisle full of vegetables and pile on the bags of spinach, kale, broccoli, and so forth into our basket. This time, though, I walked around the store like a hypnotized person and kept squealing at all the pumpkin flavored items that were available. Fall is my favorite season to dress for. Plaids, scarves, beanies, burgundy and olive tones, over the knee boots, dark lipstick colors… I could go on and on! I LOVE THEM ALL! I absolutely love that this dolman tunic from The Mint Julep Boutique is long and slouchy enough that I get to wear it as a little mini dress (perks of being short, yay!). The material of this slouchy dolman tunic is SO soft and cozy – it is absolutely perfect for fall! I am so excited because the lovely people from The Mint Julep Boutique is giving all of my marblelous readers exclusive access to purchase any slouchy dolman tunic of your choice for only $24(regular price is $48)! That’s a whopping 50% off!! 🙌🏻 Click here to gain access to this exclusive offer and choose from several different color options! They are always adding more colors, so make sure to check back every so often! I snagged my Steve Madden over the knee boots during the #Nsale and it’s sold out, but I’ve linked similar ones(all under $100!) down below! 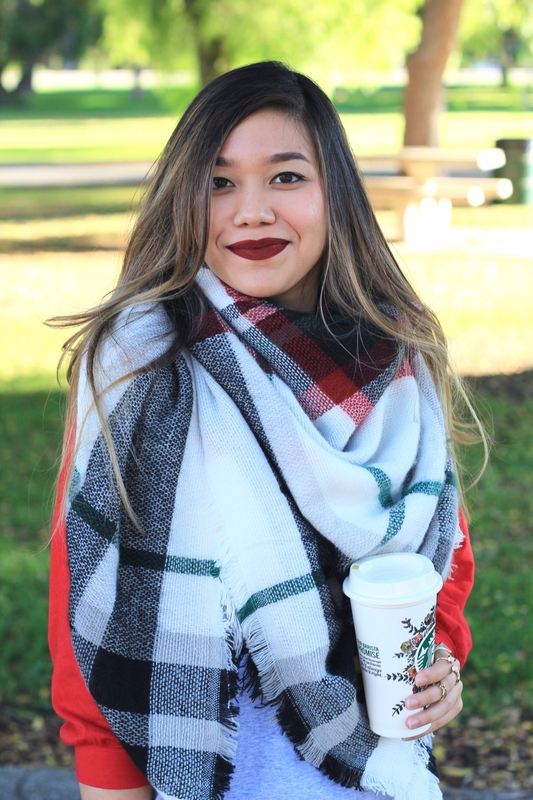 Disclosure: I was not compensated for this post; however, I did receive this plaid blanket scarf and slouchy dolman tunic from The Mint Julep Boutique for my review. All opinions are my own and not influenced in any way. I like the blanket scarf and the knee high boots. You look great! I wish we had this culture in Australia but we’re just about to head into Summer! I love this fall look though babe – you look so cosy!! such a cute scarf and love your burgundy bag! haha I feel ya, girl! 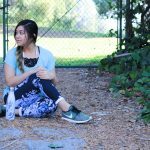 I was internally dying of heat because it was 90 degrees out when these shots were taken! But thankfully it has started to cool down in LA the past few days! It’s beginning to look a lot like fall now!! I’m so excited October is here! I also love Trader Joe’s pumpkin spice waffles. The always have the best holidY food. Great look for fall doll! 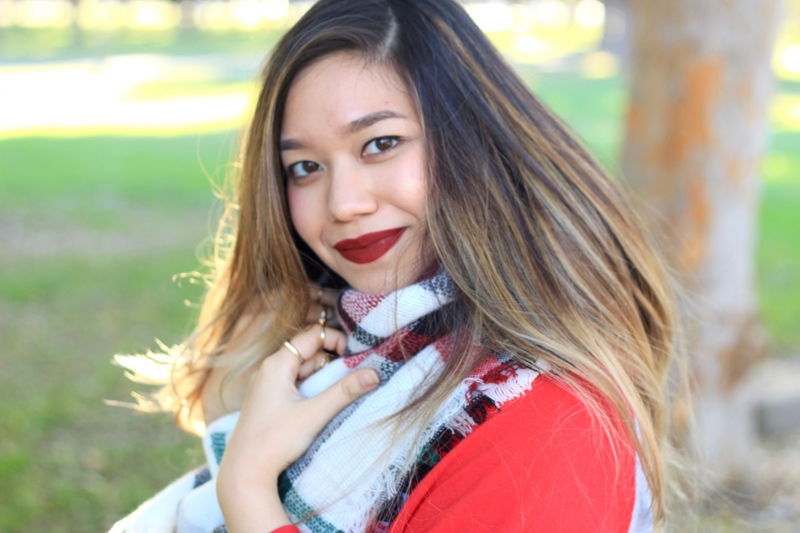 That looks like the perfect blanket scarf! So big and cozy. And I love that lip color on you! You look so cute! I love the color combination you put together. And I agree, pumpkin everything from Trader Joes! 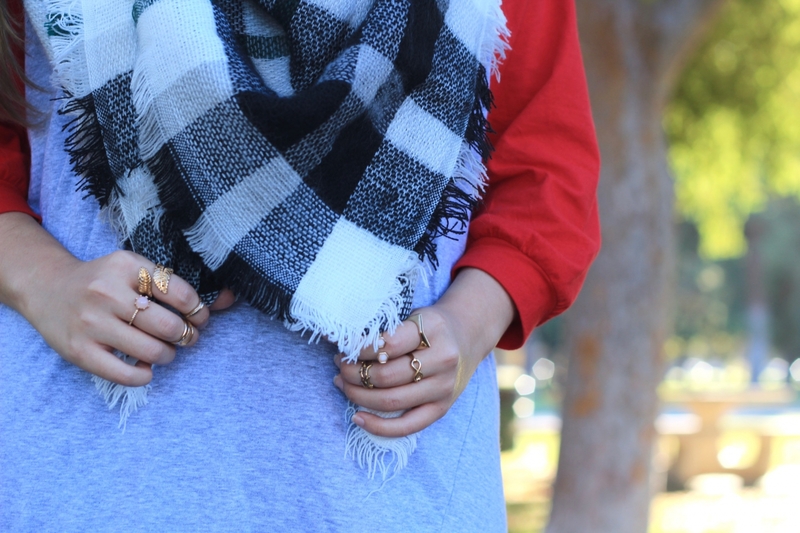 I am huge fan of blanket scarves and I love this layered look you’ve pulled together. 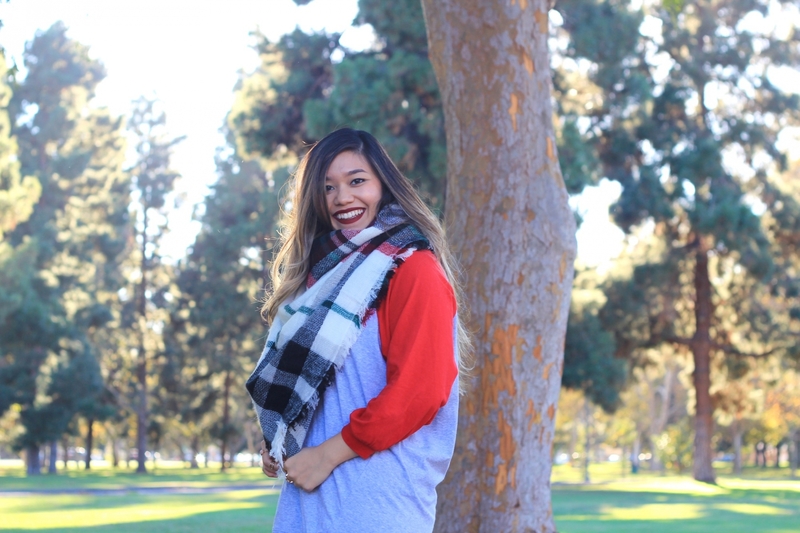 The red sleeves and subtle red in the scarf feels cohesive but not too matchy. I love scarfs. I need to get some thicker ones like this for the cooler months. I’m also IN LOVE with those boots!! 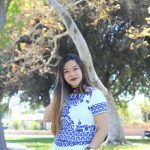 I got the same tunic from the Mint Julep! 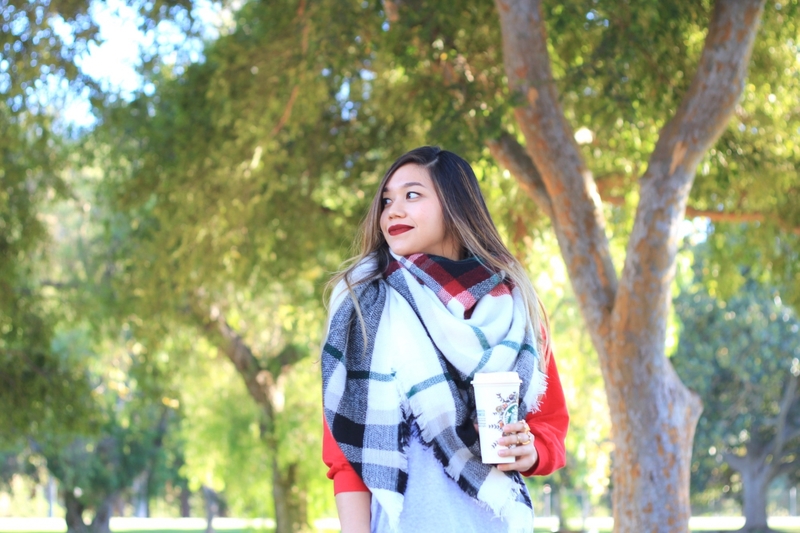 Love how you styled it with the blanket scarf! I love your scarf, but girl! Those boots are on point!!! 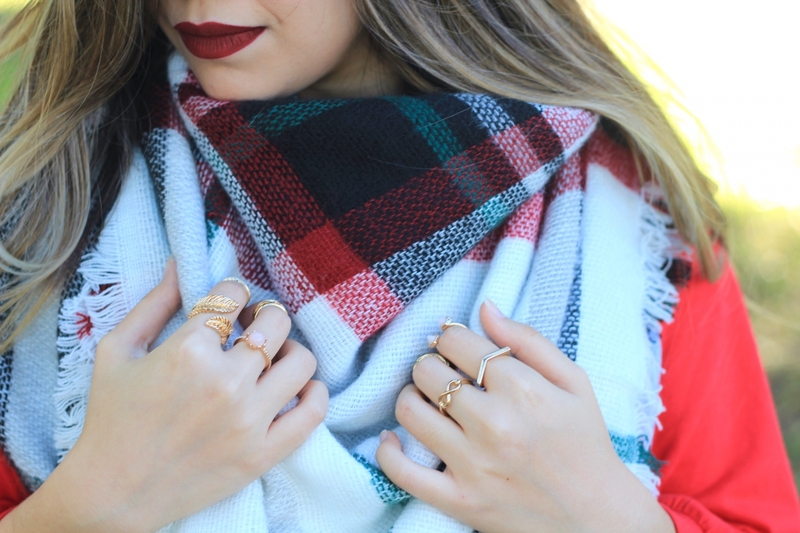 Nothing beats a plaid blanket scarf for Fall. I’m loving how neutral this one is. I love the tunic! I have the same one in orange, and it’s my favorite. The scarf also screams fall. Love the outfit!! Love this outfit, those boots are gorgeous! Perfect fall style. Love this scarf and handbag, both perfect for fall! Loving your style! I just adore your plaid scarf babe!